In what was a tougher-than-it-should-have-been encounter in Berlin, FC Bayern München booked their place in the last eight of the DFB Pokal. They are now favourites to win the tournament. Or are they? In what was a good night for Bayern’s flying wingers, Serge Gnabry bagged a lovely brace and Kingsley Coman forced home a deserved winner in extra time. Teams can win football matches on the back of a good defence, even if they are unable to score goals. Then there are those occasions when a porous back line can be offset by scoring more goals than you concede. Only very rarely can a team win with both a poor defence and off-key attack. I call this the Devil’s Equation. Somehow, FC Bayern were able to fudge the maths in Berlin. Niko Kovač’s side conceded twice against a very ordinary Hertha side, and once again a defensive lapse gifted the opposition with a soft goal. At the other end, chances came and went. The Bavarians managed to sneak through in extra time, but the simple truth is that it should have been over long before then. With the Champions League tie against Liverpool fast approaching, there are plenty of reasons to be concerned. The one upside is that Jürgen Klopp’s men are not looking too crash-hot right now either. At times, I am beginning to think that I am starting to sound like a broken record. But the needle is stuck, and there are no obvious signs that the situation is going to correct itself anytime soon. Once again, Bayern dominated the game but were let down by their lack of consistency and ongoing profligacy in front of goal. As against Bayer Leverkusen at the weekend, Die Roten dominated the possession, racked up more passes, and created far more opportunities. But slack defending meant that Hertha were always in the contest, while a raft of missed chances meant that the Berliners were not put away as quickly as they should have been. Unlike Leverkusen, Pál Dárdai’s men relied on their tried and tested strategy of parking the bus. It meant that despite Bayern’s statistical dominance, they actually looked worse then they did at the weekend. Thankfully, and unlike this season’s earlier encounter in Berlin, Bayern did manage to convert three of their 23 shots on goal. I was unable to watch the game last night, and found myself following events on kicker.de and Twitter. For every half-dozen match comments, there was a barb about Niko Kovač. For some so-called fans, the coach cannot do anything right. When a result doesn’t fall in our favour, the keyboard warriors are out in force, moaning about a poor selection or a strange substitution. Despite just seeing the potted highlights, I will trust those who were able to offer a more even perspective. Joshua Kimmich is going through a poor spell at the moment, and this has nothing to do with the coach. Serge Gnabry being subbed out was all down to his running out of steam. Mats Hummels’ defensive lapse was his and his alone. Following Dortmund’s shootout shock against Werder Bremen, Bayern are now the hot favourites to lift the golden Pott in Berlin. In the recent past, nobody would have argued with this. However, this season has been different. RB Leipzig are the obvious threat, but everybody will be wanting to have a shot. Don’t understand how one can not point out the terrible mistakes last two games by Hummels – obvious in this one and also 65% fault on the 2-1 in leverkusen game … rest goes to Alana who is often at fault in big goals against … kimmich ? My aim is just to provide three talking points. I was actually going to focus on the defensive errors, but chose not to. I did however mention the Hummels lapse. I don’t know which is more difficult to take seriously, the pompous, self-promoted way you describe yourself in the text below your post “historian, contrarian” or the fact you think our fans, who are reasonable enough to know that Kovac is out of his depth, are eternally wishy washy about it. I speak for those whose intellegence you denegrate when I state: Kovac is out of his depth. As a young, defensive minded, and expressive figure of authority on the pitch, I do like his energy…but do our players? He is not the right fit for the system we have, and he lacks the real ($) backing of your Tax-evading Uli Hoeness. Niko will be gone in the summer, seeing that this season has been left to Chance. How do I know? Folgen das Geld. I hope I do not insult you, but as Bayern supporters we should discuss Kovac’s future openly. We represent two currents headed in opposite directions and our fellow fans are divided. It is my Twitter profile rehashed. I was once called a contrarian by a political mass debater; I liked it and decided to own it. So there we are. Right, as for the serious bit: Kovac. Nobody is being denegrated; I am simply tired of seeing the constant drip-feed of critical comments when the problems really lie elsewhere. The coach is not to blame for defensive mishaps, goalkeeping gaffes or James not being able to use his right foot. Any relatively inexperienced coach is going to be treading water at some point. They all start somewhere, and only the select few are able to sprinkle fairy dust from day one. All I am saying is that we cut the guy a little slack. As for fitting the system, what is this supposed to mean? At Bayern, there are two layers. 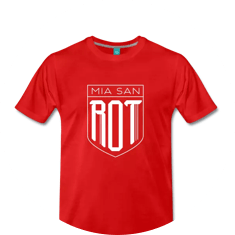 The “Mia san mia” layer and the more orthodox interpretation on the pitch. I think as a past player he fits the former. This is one of the reasons he was appointed. As for the latter, we are talking about his having to work with a team that is in transition, and one that has never really had a system in place after the Guardiola interregnum. It didn’t work with an experienced coach like Carlo Ancelotti either, and Jupp Heynckes was only able to paper over the cracks. As far as I am concerned, the system needs to be defined by the coach. I am backing Niko, provided he gets the right level of support from above, to press on with this. Some players may not like it, but it is their role to work to the system and adapt. a coach should not have the daily pressures of his job magnified by the bleating of primadonnas. Yes, Uli and co. need to throw more more money in. For sure, no argument about that. We are already starting to see this. No insult taken, and I actually find these comments refreshing (if indeed somewhat contrarian). What I am certain about is that despite out being on separate currents we are both seeking the same objective in the long term. FC Bayern is emerging from what has been an astonishing era – something I have never known as a fan. Nobody could have expected it to last forever, and the mission now is to knuckle down and set about creating the platform for the next successful cycle. I genuinely believe that sticking with a coach is key to this.